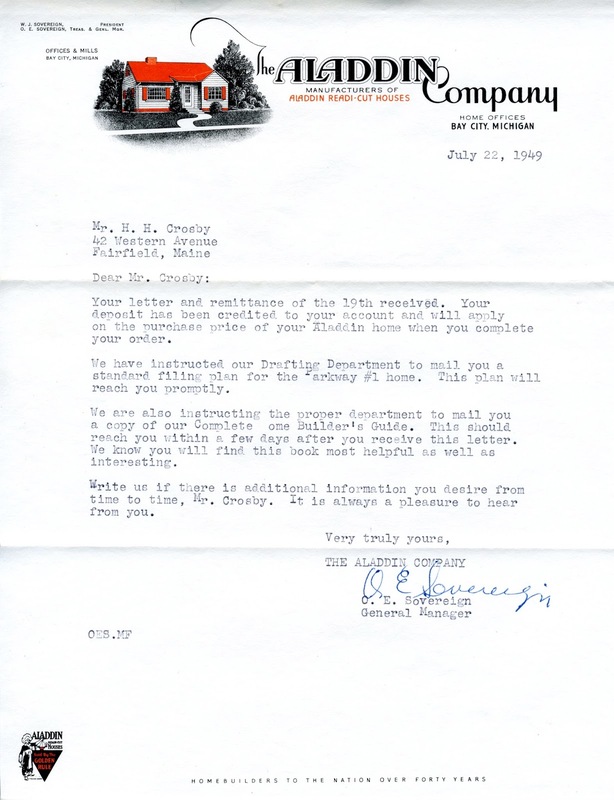 It is highly unusual to find the original correspondence, receipts, and packing lists associated with a kit house. Recently, I posted about a Sears house in Indiana that had all the original documentation from Sears Roebuck. 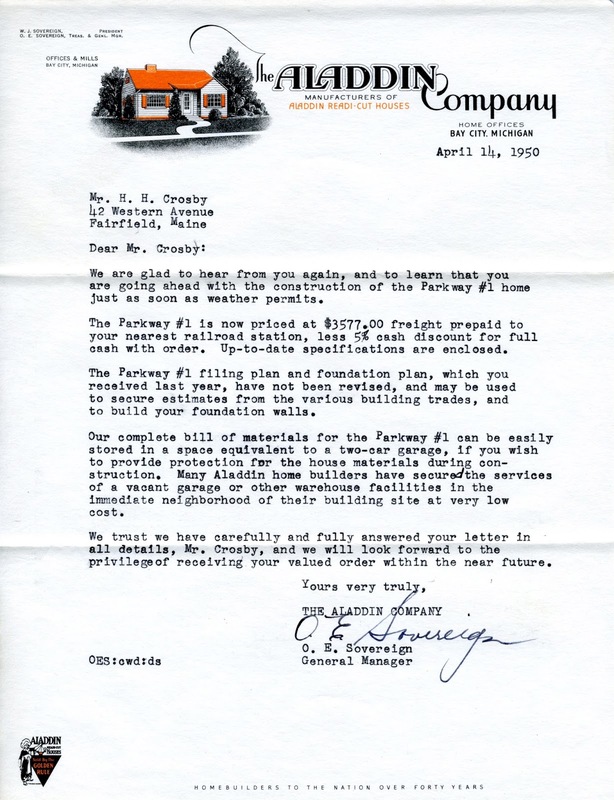 Today, we're going to feature a 1950 Aladdin Parkway in Maine that has all its original documentation. Let's take a look at the Aladdin Parkway as it stands today. 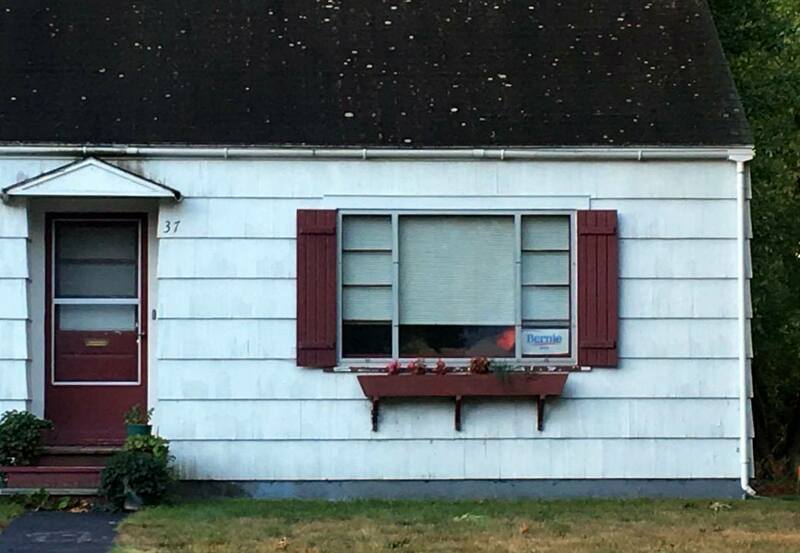 37 Western Ave., Fairfield, Maine. Image courtesy of Google Streetview. The Aladdin Parkway. Aladdin said that this was an actual photo of a Parkway... somewhere. Scan courtesy of Daily Bungalow. The Parkway in Maine has a reversed floor plan. 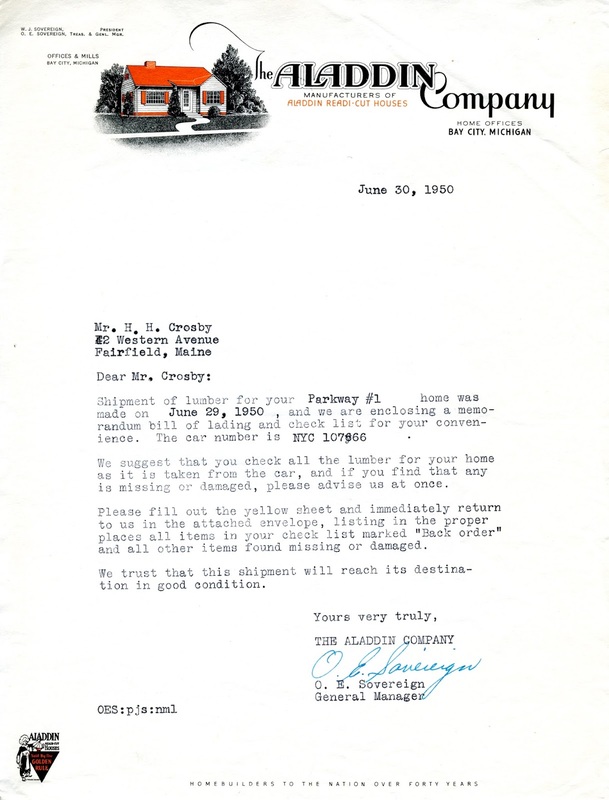 It was originally purchased by Halstead H. Crosby and his wife, Katharine. They were married in 1946 and placed a deposit on the Aladdin Parkway in the summer of 1949. All subsequent scans on this page courtesy of Antique Home unless otherwise noted. If you can't read the letters, just click on the images for a clearer view. Aladdin received Halstead's deposit and was going to send a standard filing and foundation plan for the Parkway #1 as well as the Complete Home Builder's Guide. These plans enabled the Crosbys to get estimates from local tradesmen as to what it would take to lay the foundation and construct the house. 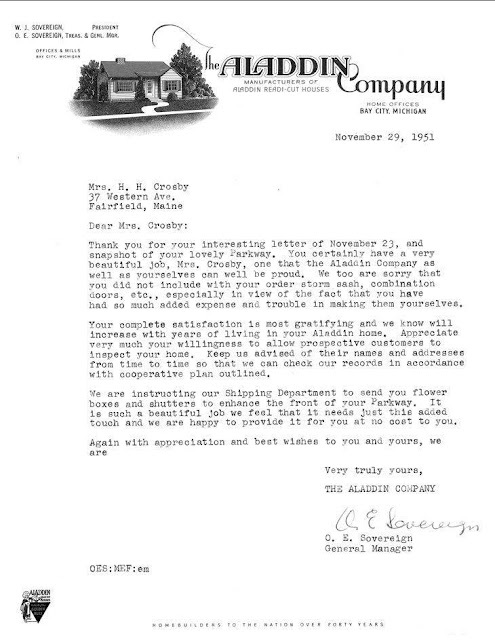 In April 1950, Halstead wrote to Aladdin, letting them know he was ready to start building. Aladdin gave him the new 1950 price for the Parkway #1 which was $3577. 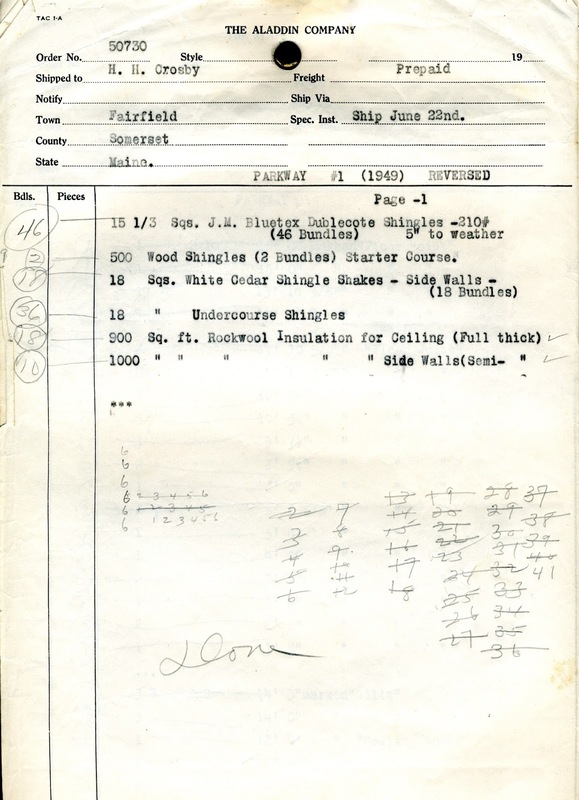 Halstead asked where he could store all the materials once he received them. Aladdin said that they can easily fit into a two-car garage, and that some customers rent out a nearby garage or warehouse space. On June 8, Aladdin writes to say they received his payment. 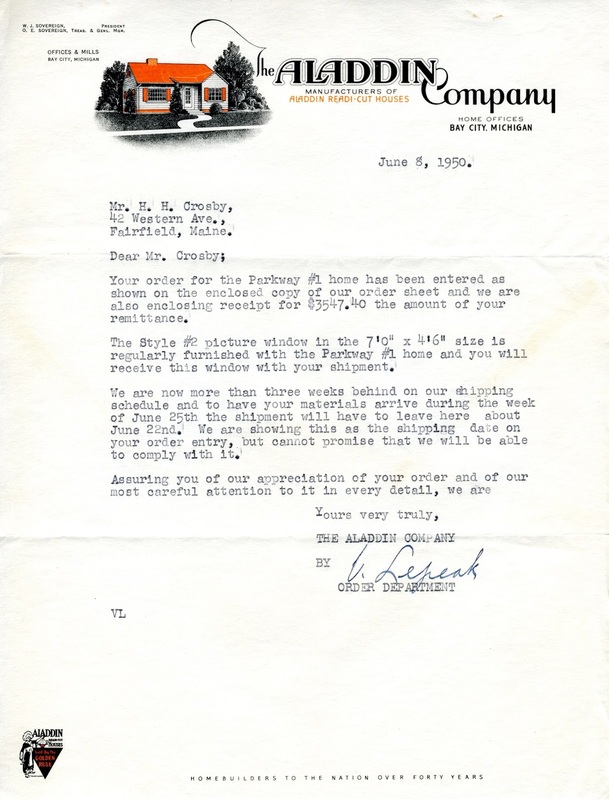 It must have been nerve wracking for the Crosbys to send thousands of dollars in cash to a far-away company in Michigan! The Crosbys wanted to have a different style of picture window in the front of the house. 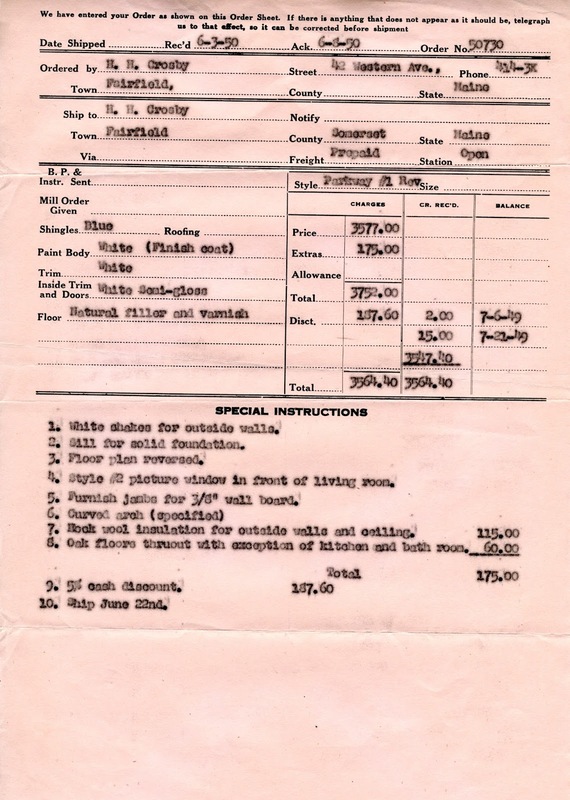 Here's the receipt that was sent with the preceding letter. Aladdin shipped the order on June 29, slightly later than they estimated. They enclosed a bill of lading and also a checklist to be returned to Aladdin. A sample of the bill of lading sheets that the Crosbys received for the Parkway #1 Reversed. I love this letter! In 1951 Katharine wrote Aladdin to express her happiness with the house and also to send them a photo of the finished Parkway. She said she would be willing to let prospective customers tour the house. Aladdin responds that they will be sending her flower boxes and shutters at no cost (apparently not included in the original order)! Scan courtesy of Carly Wiggin. There they are! Photo courtesy of Carly Wiggin. 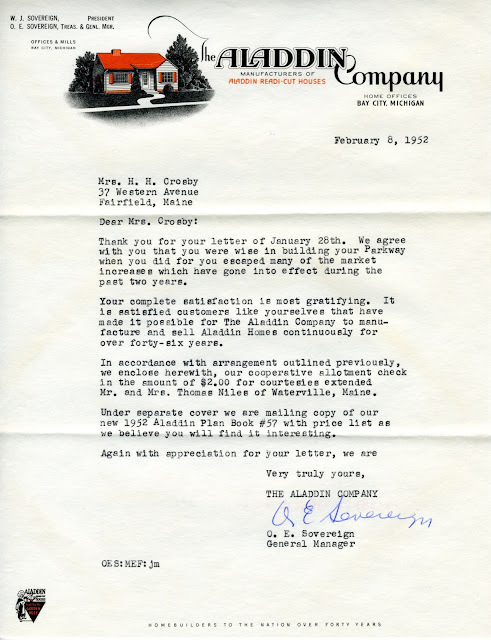 The final correspondence between the Crosbys and Aladdin in February 1952. It appears that Katharine wrote Aladdin to express how happy she was that they bought the house before recent price increases. Aladdin sent the Crosbys a $2.00 check for letting prospective customers Mr. and Mrs. Niles tour their Parkway! Halstead and Katharine were married 60 years and lived in the Parkway until they moved into assisted living. Halstead died in April 2007 and Katharine died six weeks later, at the ages of 94 and 95, respectively. Katherine's niece sold the house to the current homeowner. I can't imagine having to check for every piece of lumber! Great to see this documentation of the entire process. Thanks to Lauren and the current homeowner!